What makes a Cambridge academic — and thousands of other people — decide that sitting in a road is their best chance of being heard? In short, nothing else has got us the emissions cuts we need. The declaration that global warming is real and that greenhouse-gas emissions need to be cut came in 1988, when I was a year old. Since then, scientists have continued to be honest brokers, monitoring greenhouse gases, running models, presenting the facts to governments and to the people. And emissions have continued to climb. The 2018 IPCC report that shocked many of us into action told us we have 12 years to almost halve emissions, or face conditions incompatible with civilisation. How did we end up here? The thing is that on the other side are the dishonest brokers. The fossil-fuel corporations not afraid to spend big money to influence policymakers. That fund ‘independent’ think-tanks that muddy the waters about whether climate change is happening, and whether it is serious. The spin doctors that got us using ‘climate change’ because it sounded less scary than ‘global warming’. Rupert Murdoch sitting on the advisory board of Genie Oil and alternately ignoring and mocking climate scientists and protesters through his ‘news’ outlets. These people are not afraid to play on people’s emotions. They and their kind shout that anyone trying to call for real action on emissions is a radical, a criminal, is trying to make everyone live in a communist hovel, that jobs will be lost, that climate breakdown is either a Marxist-Chinese plot, not that bad, or is going to happen anyway so we may as well not bother to fix it. Psychologist Jane Morton explains what receiving these messages — unemotional, bland facts on the one hand, and screaming denial on the other — does to people. Most people end up somewhere in the middle, not really denying climate breakdown, but not doing anything substantial to tackle it either. This is how we end up with well-meaning but timid messages telling us we can save the world by switching lights off when we leave the room, which ignore the powerful corporations and corrupt politicians who keeping us hooked on fossil fuels. That, Morton says, is why we need emergency messaging — the tactic followed by Extinction Rebellion. Talk to people’s emotions. Make them afraid — talk about the risks of less food, mass migration, war, and harm to their children. By making it clear that this is a climate emergency, we shift the centre ground to a place where people are more worried. Further, make it clear that climate breakdown is not inevitable; it is due to the actions of immoral billionaires like Mr Murdoch and those at Shell, BP, and Exxon-Mobil. Make people angry about that. And give people hope, and courage. Tell true stories about ordinary people working together to push out the immoral billionaires (there are climate examples in Naomi Klein’s ‘This Changes Everything’, and broader grassroots wins in Rebecca Solnit’s ‘Hope in the Dark’). Tell people there are solutions, we just need to use them. Getting emotions — fear, anger, hope — involved may feel uncomfortable. But facts are not enough. We need stronger messages to reach the public, and as most news media are failing on this (looking at you, BBC), we need to roll our sleeves up and do it ourselves. This is where Extinction Rebellion comes in. Virtually unknown in October 2018, by mid-November this non-violent direct-action group had 6,000 people blocking bridges in central London, and their stark skull and hourglass imagery was splashed across the press. 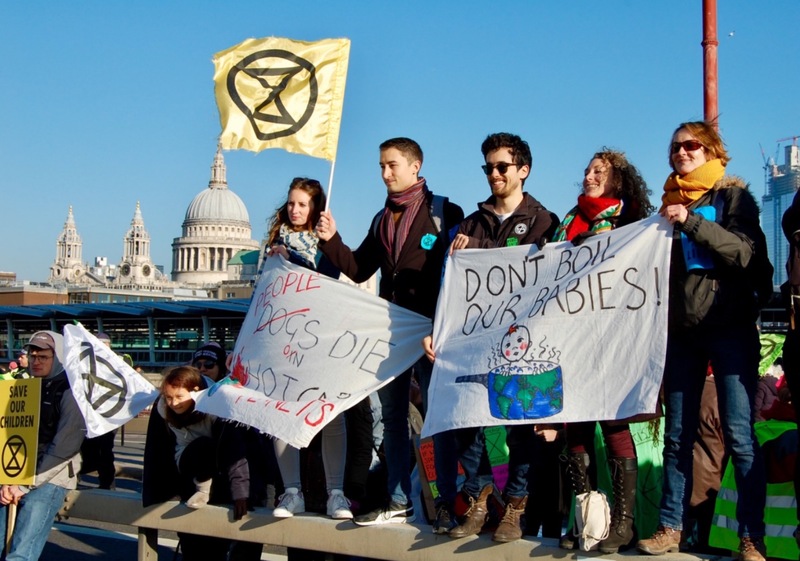 The group has three large demands: that the UK government declares a climate emergency, that the UK goes carbon neutral by 2025, and that how we go carbon neutral is decided by a citizen’s assembly. In the long term, they aim to get these demands across the world. In the short term, they demand an end to fracking in the UK and a cancellation of the new Heathrow runway. The demands might seem ambitious, and perhaps unclear on the specifics (to avoid factionalism, I am told), but their boldness appears to have captured a mood, and spoken to enough people to gridlock central London. People die on hot planets: Emergency messaging as the Extinction Rebellion flag flies over St Paul’s Cathedral. Author second from right. We need bold scientific work that transcends disciplines to help us build a better future. But we also have to be honest about what is preventing that better future — powerful vested interests, fetishisation of economic growth, and structural inequalities — and realise that these are not problems that we can solve with the scientific toolkit alone. These are issues that need to be tackled through other means. You don’t have to sacrifice scientific integrity to rebel, as these protestors show. Not engaging is to miss an exciting opportunity. 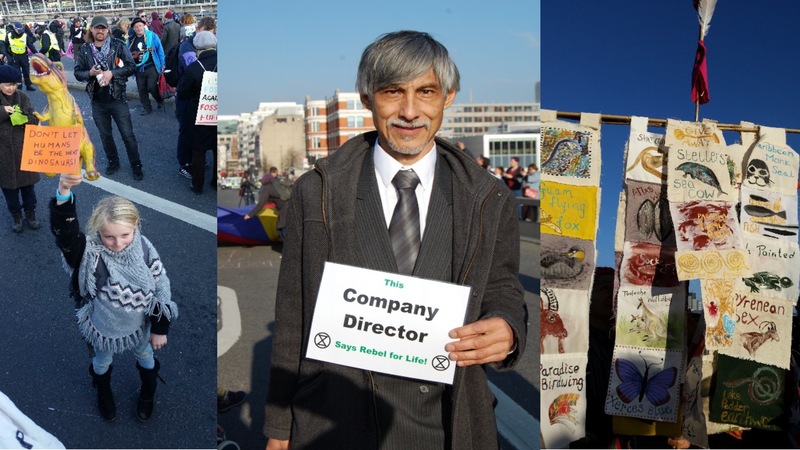 Extinction Rebellion draws on cofounder Roger Hallam’s PhD work on effective ways to maximise political participation, and as part of that the movement is rapidly ‘decentralising’ — each local group is starting to plan its own actions and demands. I’m working with my local Extinction Rebellion group to decide what we do here. Do we agree on every detail? No, but we’re on the same page. Do I think it’s powerful to work with a citizen movement demanding real change? Yes, and I hope with the range of academics in my local group (as well as other smart, wonderful people with diverse skills), we can deliver a strong manifesto. While the UK government targets are at 80% emissions reductions by 2050, some councils are shifting closer to the Extinction Rebellion position, with a declaration of climate emergency by Bristol council and a unanimous motion for a zero-carbon city by 2030. Norwich is considering following suit. Some of our local Labour party have already said privately that they are inspired by Extinction Rebellion, and are calling for stronger climate action in Cambridge. If you are truly objective in your science, and do not care what about the state of the planet in thirty, fifty, a hundred years time, then absolutely stay at home. But if like me you are a human being with values and wishes and dreams, who wants to live and have a family without fear of societal collapse on a planet that supports beauty and life in abundance, then get involved with activism, politics, and advocacy. Use the credibility and the platform that you have as a scientist. Go on the radio, or on TV, and talk about climate breakdown with other human beings. Write. Run for office. Make beautiful banners that reference scientific papers (see picture). Pressure your legal representatives. Organise, set up an Extinction Rebellion chapter in your country or join an existing one, and protest, cause disruption, and force governments to listen — because until now they have not been made to take sufficient action on the biggest threat to life on earth. Of course every mass movement is imperfect, because it is made up of multiple, imperfect human beings. Extinction Rebellion is no exception. But it is energetic, bold, inclusive, and taking off across the world, calling for serious action on climate change and species extinctions, and inspiring civil disobedience on a scale I have never seen. Scientists and conservationists have been asking people to care about the planet and other species for years. When people rise up, we should be among them. Is there an extinction rebellion group in Australia? Not that I am aware (yet), but I’m thinking of starting it here myself if not. Maybe contact the XR HQ to find out? https://xrebellion.org/ I know groups are starting to spring up over Europe and South America. Probably also good to coordinate with the school strikes in Australia! Best of luck! But isn’t it ironic that every one of us has an extremely effective way of reducing climate change – simply by removing meat from your diet. Suggest this and most of these protesters will start screaming “bias”! (namely, what the climate change perpetrators do). Everyone’s happy to protest “Big [insert company] – it’s easy to vilify companies, corporations. But when it comes to making personal change, people balk. I am in no way denying or letting off these immoral oil companies or stagnating governments. But what I am saying is that real actions will come from simple, personal actions with large effect – and removing meat from ones diet represents exactly this. We can’t wait for politicians to do something, and my thoughts on protests are mixed (sometimes emphasising the us vs. them mentality can just create backlash). Not eating meat is a very powerful way of addressing many environmental ills (not just land clearing, but habitat loss and fragmentation, eutrophication, soil compaction, soil erosion, predator persecution, overgrazing, competition), as well as increasing our circle of compassion. Nothing embodies a non-violent movement more than not eating meat (killing someone for meat is a very violent act). If only people took that to heart. Hi Kit, thanks for the comment. I don’t see it as either/or. I have been vegetarian (or 99% veggie) since I was 4; now I am mostly vegan in the house, and mostly vegetarian outside it (amazingly more and more people are able to cater to me as vegan). My partner has been on radio and in the newspapers in his country, a beef producing part of South America, telling people why they need to eat less meat. A lot of the people in the XR movement make similar dietary choices. So I understand that personal choice is important. But this is nowhere near enough. 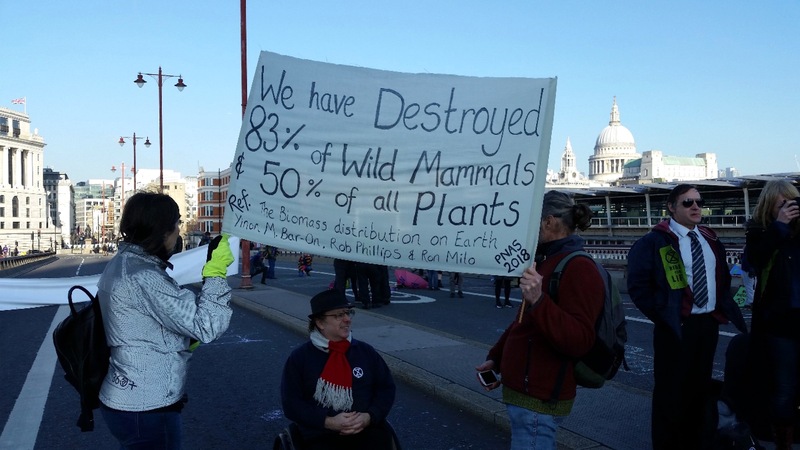 We can recycle, ride our bikes to work, stop flying, and not eat meat or dairy, but these individual choices are not enough unless we create systemic change; globally, our emissions are rising at an alarming rate and we are seeing more exploitation of fossil reserves, not less. Unless we get everyone in the world to go vegan and stop flying by choice, it won’t make much difference; and good luck with that. At XR we are not ‘waiting for the government to act’; we are using tactics of disruption and persistence to try to force them to. There is no green infrastructure choice for many people across the world; for example, I have a choice to heat my (rented) home with gas or wood, and have no option to heat with renewables. Many people live in places only served by a combustion engine. Governments ultimately need to step in to create a green infrastructure on a massive scale that everyone can use, to stop oil drilling and gas extraction, and so on. We are trying to shift the dialogue to take the emphasis off the ‘invisible hand of the market’, where nobody is accountable, and put in back on the nation state. The UK government could ban fracking tomorrow, for example, and reinstate the solar subsidies that they scrapped – if they felt they had to. This is way too big a topic to deal with in one article but, ultimately, we need a change in the fundamental way that economics works; Tim Jackson’s ‘Prosperity without Growth’ shows that resource use is still very strongly linked to GDP, so we need to develop the macroeconomics of steady state and degrowth societies to achieve any measure of ‘sustainability’. Individual choices alone won’t hack it.